Posted on Tue, Oct 9, 2012 : 11:44 a.m.
Shana Milkie works with the Stone Soup cooperative of Amish farmers who provide a winter storage crop CSA with locally grown whole grains and storage root crops. It's the time of year when our CSA box grows heavier by the week, with an explosion of squash, potatoes, cabbage and kale subsuming a diminishing tide of tomatoes, peppers and eggplant. Just like the end of a fireworks spectacular, our summer farm membership is entering its finale. That filmy harvest moon, a smell of woodsmoke in the air, and dark frosty mornings remind me that the seasons are changing and it's time to sign up for a new round of CSA membership for this fall and winter. Fresh local produce in fall and winter are possible now because as the summer CSA model grows and matures, it has diversified and taken on new forms and new seasons. A crucial (re)development for community food security in our area has been the increasing use of root cellars for storage, and the construction of passive solar greenhouses (called hoophouses or high tunnels) that extend the growing season and make it possible to grow food year-round, even in a northern climate. Four season farming with hoophouses (pioneered in our area by Shannon Brines) is taking off, so that now many of the CSAs in our area are beginning to offer spring, fall, winter season farm shares in addition to the traditional summer CSA share. We also have new types of CSAs that offer options like locally grown and hand-processed frozen fruits and vegetables from Locavorious, or ready-made dishes prepared from locally grown food available from Harvest Kitchen (which even offers home delivery). There are several meat CSAs, along with the Motherloaf Bread CSA and the Stone Soup Roots and Grains storage crop CSA being offered by Amish farmers for the winter. The benefits of CSA membership are legion — for farmers, for the community as a whole, and especially for eaters. Senior researcher Nancy Sherwood in the Minnesota Star Tribune says: "With obesity, heart disease and diabetes now national epidemics, the potential for CSAs to improve diets and ultimately health has caught the attention of health professionals. HealthPartners, an insurance and health care provider, is studying the impact of CSAs on eating habits. Early results suggest that most people who sign up for CSAs eat more vegetables and a greater variety of them." 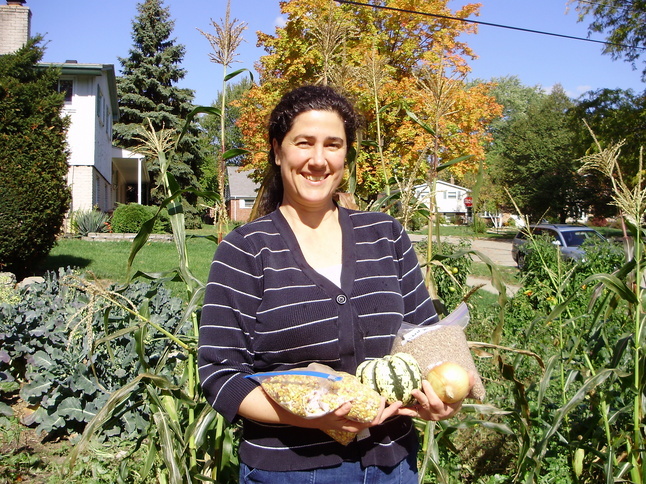 Shana Milkie says she benefits because the "Stone Soup CSA fills a niche by providing hard-to-find locally grown grains in whole form." And farmers benefit also "by serving customers during the slow fall and winter seasons" when produce sales at farmers markets is not providing much income." .I think it is the best season for eating. With holidays and grey skies coming up it is important to eat your vegetables. Our members find it is easier to feed themselves and their families by having a CSA during this busy season. Eating local year round is crucial to building a sustainable food community in Ann Arbor." For people who want to know their farmers and eat locally and seasonally all year, the number of choices continues to grow. Below is a list of CSA options for this fall and winter that can help you eat your vegetables. It's a way to improve your health, and the economic and environmental health of the community at the same time. Pickup time/day/location: Saturdays Ann Arbor Farmers Market, 8 a.m.-11:45 a.m.
Includes: Winter squash, sweet potatoes, potatoes, carrots, storage and salad turnips (often), storage and salad radish, many kinds of chard (often), many kinds of kale (often), collards (often), some of the summer harvest frozen (e.g. tomatoes), Asian greens including pac choi, Komatsuna, Tokyo Bekana, Mizuna etc. (other), mustard greens (often), spinach (often), salad mix (often), hardy winter greens, green onions. Weekly cost: Fall (includes large Holiday share): $40/wk. ; Winter: $27.70/wk. ; Spring: $30/wk. Winter: This year we'll offer a heart of winter session. Starting Jan. 9, we'll distribute every other week through March 6. We'll aim to distribute at least seven to 10 items which will be a mix of storage crops (winter squash, potatoes, onions, garlic and maybe sweet potatoes), greens (beet greens, spinach, choi, yukina savoy, kale, chard), root crops (such as turnips, carrots, beets) salad mixes (young mizuna, lettuce, choi, blossoms) and herbs (chives, parsley, dry or fresh rosemary, thyme, etc). This is our first year we're offering the "dead of winter" session and are doing so every other week to allow the plants to recover more completely during this slow-growth period between harvests. Spring: This session will begin March 13 and end May 22. Total cost is $330. The distributions will be weekly and will build on the offerings of winter, minus storage crops plus more greens. We'll also add a few delicacies such as snow peas, rhubarb, more herbs and maybe spring flowers. This session is for the serious greens-lover only! Pick up is the same time/day as winter. Although it has already filled its membership for Fall/Winter 2012, Green Things Farm offers a 50 member diverse fall vegetable CSA which runs for 15 weeks from mid-September to mid-December. Cost is $400 for a standard share (which feeds a family of two adults) or $550 for a large share (to feed a larger family or designed to be split between two households). Distribution is on Thursday afternoons or Friday afternoons at Haisley Elementary. The Stone Soup staple foods CSA is for people wishing to secure staple foods in bulk amounts who will be doing some of their own storage. A single share is aimed at supplying a household of 2-4 people over the 6-9 months of the harvest/storage season. The share will be divided over four deliveries during Fall 2012 - Winter 2013 (September, November, January, and March). Pickup will be at the Ann Arbor Farmers’ Market, the Ypsilanti Farmers’ Market or a northwest Ann Arbor home. A share includes 60 pounds of wheat berries, 24 pounds of oat groats, 24 pounds of rye berries, 12 pounds of dried corn, 30 pounds of onions, 30 pounds of carrots, 30 pounds of potatoes and 12 pounds of popcorn. The price of a share is $300. There is some availability of shares for the current season and we are also taking inquiries for next year. Please contact Shana Milkie at 734-332-1106 or smilkie@mich.com or visit http://www.localharvest.org/stone-stoup-grains-and-roots-csa-M49390 for more information. Sunseed Farm offers a CSA farm share through the seasons in three 16-week sessions. Vegetables are grown using ecological growing practices and avoiding synthetic pesticides and fertilizers. The share includes fresh greens, root vegetables and herbs from our hoophouses and storage vegetables from our fall harvest including potatoes, onions, winter squash and more. Total cost: $580/full share, $310/half share (half share includes full pickups every other week). Pro-rated shares available. Pickup time/day/location: Thursdays 4-6:30pm at Sunseed Farm (about 5 miles northwest of downtown). Fridays 7:00-10:00am at Selma Cafe (722 Soule Blvd., Ann Arbor). Website/signup: http://www.farmsunseed.com and click "CSA." Number of weeks: Fall - 3. Thanksgiving - 1. Total cost: Fall: $96. Thanksgiving: $108. Saturday 8 a.m.-noon at Washtenaw Food Hub on Whitmore Lake Road in Ann Arbor. Wednesday 7 a.m.-noon at the Ann Arbor Farmers Market and Washtenaw Food Hub from 8 a.m.-noon on Whitmore Lake Road in Ann Arbor. THANKSGIVING SHARE pick up is Nov. 17 at the Ann Arbor Farmers Market from 7 a.m.-noon OR at Tantre Farm from 2-5 p.m.
EXTENDED FALL SHARE: Each week we will try to have 10 to 16 items, which may include a variety of cooking greens (kale, collards, tatsoi, spinach), salad greens (baby lettuce, spicy mix, arugula, mizuna), brassicas (broccoli, cabbage, kohlrabi), roots (potatoes, turnips, sweet potatoes, carrots, radishes, beets), fruiting veggies (tomatoes, dried heirloom beans, 4 to 6 varieties of winter squash and pie pumpkins), and alliums (garlic, onions). Also, a weekly newsletter will be sent out with storage tips, recipes, etc. THANKSGIVING SHARE: You will receive a newsletter with storage tips and recipes for 60 to 80 pounds of some variety of the following to stock up for the winter or just for Thanksgiving festivities: potatoes, cabbage, winter squash, pie pumpkins, garlic, Brussels sprouts, beets, rutabaga, onions, leeks, carrots, kale, collard greens, spinach, Asian greens, cauliflower, broccoli, dried beans, and turnips. A special addition to our share is a 24-ounce jar ($12 value) of locally-grown, lacto-fermented veggies (some from Tantre Farm) from a local business called "The Brinery" (www.thebrinery.com). Harvest kitchen offers prepared meals using ingredients from local farms. One popular way to get our food is to become a subscriber. You can start and stop your subscription as it suits your schedule. Each week you get 2 mains, a soup, a side, and a salad. Sizes/pricing for 1, 2, or 4 people available. As far as what's included, pricing, and schedule, and pick up days, there are about a million options. See www.harvest-kitchen.com and navigate to weekly subscription options to see the details. We even offer home delivery! Saturday: Ann Arbor Farmers Market, 8 a.m. - 1:30 p.m.
Tuesday: evening pick-up at the Corner Brewery, 5-7:30 p.m.
What's included: Each month subscribers get 7 or 8 different recipe-ready items, for a total of 28-30 packages of frozen food during the winter. The share is approximately 1/2 fruit and 1/2 vegetables. Each share pick-up comes with a recipe guide that includes information about each item, tips and recommendations for preparation, ideas, and recipes. Tue, Oct 9, 2012 : 11:30 p.m.